Have you recently bumped into a blog with a big notification bar at the top of the page? As a blogger these notification bars are very useful for increasing conversion, driving traffic to a specific page, or even to increase affiliate sales! HelloBar is one of the more popular lead generation tools available, and it allows you to add these eye-catching notification bars to the top of a webpage. I have been using this tool myself for about eight months now, and it has never disappointed me. HelloBar is one easy-to-use online service that you can use with WordPress or any other platform you choose. In this guide, I have shared my experience and review of HelloBar. This guide will also serve as your DIY tutorial, allowing you to get started using HelloBar right away! HelloBar lets you add a full-width bar at the top of your blog which can be used for driving traffic to your squeeze pages, resource pages or a particular blog post. 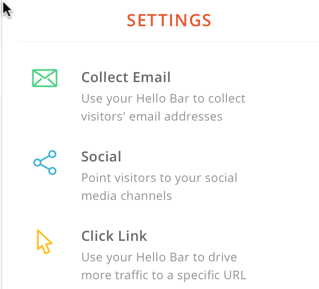 You can also use HelloBar to drive traffic to your affiliate links, capture emails and much more. Think of HelloBar as a tool to drive your existing traffic to any page of your choice. HelloBar’s dashboard is neat, and even someone with no technical skills can start using HelloBar in a minute. Any WordPress blogger can easily integrate HelloBar onto a blog with this simple WordPress plugin. 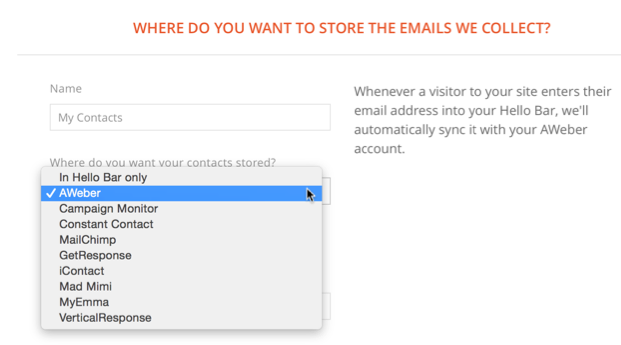 I have tried both the email capture and the “Click Links” options, and they worked like a charm. If your immediate target is to collect more email leads, you should select “Collect Email” and start building your email list. HelloBar integrates with all popular email marketing services such as Convertkit & Aweber. All the steps are self-explanatory, and you will have no trouble configuring HelloBar. Simply download the HelloBar WordPress plugin from your dashboard and install it on your blog. Once the plugin is activated on your blog, you can then configure it from your HelloBar dashboard. This tool used to be entirely free, but last year they added a “pro” version for heavy users. You should also know that in the free plan one ad is displayed in every ten views, a feature that may not be acceptable to some bloggers. You do have the option to upgrade to their Pro plan, but I find it to be on the higher side in terms of cost. If you are a heavy user, I instead recommend that you use one of the HelloBar alternatives that I have listed below. With HelloBar you can create multiple bars, and they will be rotated at regular intervals. You can also create multiple copies of the same bar, and run A/B testing by changing words, colors and so on. Overall, the A/B testing feature of HelloBar is the feature that appeals most to me. It makes it easier for an individual to find the perfect copy + color for the bar. My actual user experience with HelloBar has been great, but I am disappointed by the fact that they’ve changed their pricing and have included ads in the free plan. For a hobby blog where you don’t mind displaying ads (1 in 10 views) and the HelloBar branding, it’s a decent service. If you like the service but want to hide the HelloBar branding, you need to be prepared to upgrade your plan to the “pro” version. There are many good free and paid HelloBar alternatives out there, but there are only a few notification bars that allow you to capture email. FireBar : This is a paid alternative to HelloBar and it costs only $18. This is the only alternative that also lets you capture email. WordPress Notification Bar: Limited features, but does let you drive traffic to a particular page. DW PromoBar: Also offers a countdown timer. Better features than the two mentioned above. BugmeBar: Another paid alternative, offering cookie expiry time. Of all the available alternatives to HelloBar, I recommend that you buy FireBar, as it offers similar features to HelloBar. In conclusion, I suggest that you start using HelloBar on your blog, and once you better understand the use of notification bars, invest some money in the paid solution that works best for you. Really I think this is the bast notification bar. I join SML forum because of Eye caching Click Here button. Hello bar is really great! I just used it for email subscription and the result is surprising! As its load at the top of your website it just first center of attraction! I am very much satisfied using Hello Bar! Thanks ! Gonna install it on my blog ! Good one for notify our readers with important links. Hello-Bar has many features, Easily customizable and responsive. But Hello Bar free version not recommended because their branding Logo on the left side, and don’t get detailed traffic analytics. 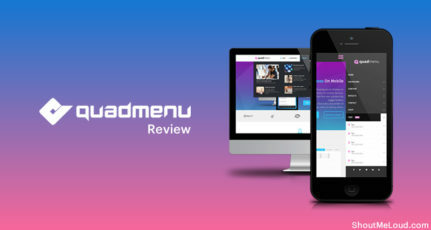 Thank you for listing the HelloBar review and alternatives. This is helpful enough for me as I was about to explore more on HelloBar for my website. Additionally, I have found HelloBar alternative plugin in SumoMe store which completely free to use. It has very similar functionalities as HelloBar. I loved HelloBar and used it for months to grow my list….until my coder developed a neat little top blog bar, custom-made, to boost my subscriber. I found HB so easy to install; even a tech dummy like me could do it so just about anybody can, with no real worries. I’d just add to make sure your offering is relevant to increase your list. The tool rocks, and you want to learn how to use it right. I like your offering to join the Shout forum. This call to action builds a sense of community around your blog, and communities, well, that’s where the massive blogging prospering is, because the more tight-knit your community becomes the more easily you’ll tap into steady cash flow. Tweeting and Pinning from Bali. Thank you for your review about hello bar. it works in blogger too. add to my blog immediately after this post. I had never heard of a hello bar. I will go check them out. Thank you for the great emails you send out that are always full of useful information. I look forward to them. I was using it before but after upgrading my site, its no longer compatible. But I still live and support the use of the plugin. Thanks for the post Bro. Hi thanks for the post Harsh. This is a very useful tool and i have used it in my website and it worked very fine with wordpress.. This. Post is also very useful..
Glad that the article helped you. keep coming back. Thanks for the useful article…I am the regular reader of ur blog..It has lot of useful information to all the bloggers.. Thanks for nice listing, actually I love HelloBar too. But it has a problem that when I install it on blogspot site. It popup on every visit on every page repeatedly on same site. Can you help me how to fix it?